Looking for that special Maine lakefront property? 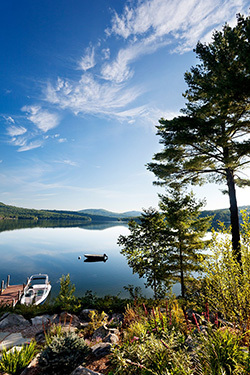 Here you'll find year-round and seasonal lakefront homes in the Lakes Region on some of Maine's most sought after lakes. Let your dream home find you! Register with the site and we'll alert you by email whenever a new property (matching your needs) comes on the market, so you'll be the first to know. Already have an account with us? Log in here. Lake homes and lakefront properties in Maine go quickly, so if you find a property you like, call us at 207-784-2525 or contact us online for more information or to schedule a private showing. Exquisite Contemporary open concept living!Great light, quality details and water views from most rooms. Gourmet chefs kitchen, hardwood floors,2 decks, stone patio, ramp and float. Expansive Master bedroom with additional office space and private deck. Can be sold with neighboring 31 Main for $639,000. A perfect summer camp getaway with beautiful water frontage on North Pond. Watch the sunrise from the front porch. Enjoy boating, fishing, or swimming off the sandy beach. Peaceful location while not far from in town amenities. Call today for a showing. 3-4 bedroom contemporary home with wrap around deck and sunny porch with beautiful views of Long Lake. Full finished basement with 2 bedrooms, 1.5 baths, game room, pellet stove and direct entrance to 2 car attached garage. Head upstairs to main level which offers an updated kitchen with granite counters and cork floor, a large living area with floor to ceiling fieldstone fireplace, open kitchen and dining area, full master bedroom with bath, 2nd bedroom, 1/2 bath and office. Deeded rights to association beach on Crystal Lake. Come relax enjoy the view,quiet calm, great frontage, 3 bedroom with small guest house, 3 vehicle garage for your toys-enjoy fishing swimming, and boating.